Low growing evergreen perennials, Arabis do differ in form and growing habit. 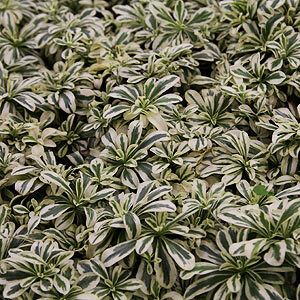 Varieties such as Arabis alpinia are dwarf forms, very low growing and compact. Masses of white flowers cover the foliage from spring to early summer. Look for A. alpinia subsp caucasia, it can be grown from seed sown in spring.Or maybe the pink flowering form A. alpinia rosea. These are mounding types of plants and are often called 'Wall Cress' , excellent in the rock garden or planted along the edge of a low wall and allowed to cascade down. Arabis procurrens on the other hand is more spreading forms a low mat, green and creamy white streaked foliage and an excellent ground cover plant. Also useful as filler between rocks and pavers. Waxy foliage is the attraction year round, it does flower, however they are insignificant compared to the foliage of varieties such as Arabis ferdinandi-coburgi 'Variegata', a choice form and is pictured right. Excellent in rock gardens as well as for under planting taller shrubs and even roses. They can be used to plant where you have naturalized spring bulbs, which will happily push their way up through the foliage. They can also be grown in containers and troughs, and are drought tolerant once established. You can find Arabis varieties for sale at the following nurseries. Specialists in rockeries, borders & raised beds. Extensive range of Alpines, Rock Plants, Grasses, Perennials and Shrubs. Available for order online.